These issues are the focus of Generations For Peace, a leading global non-profit peacebuilding organization working to solve challenges and resolve conflicts around the world. Founded by HRH Prince Feisal Al Hussein and Sarah Kabbani of Jordan in 2007, Generations For Peace focuses on empowering youth by training young volunteers in sustainable conflict transformation so they can introduce peaceful practices and spread them throughout their communities. The youth volunteers then train others in conflict resolution practices with advocacy and empowerment training in the form of activities such as sports, arts, and dialogues. 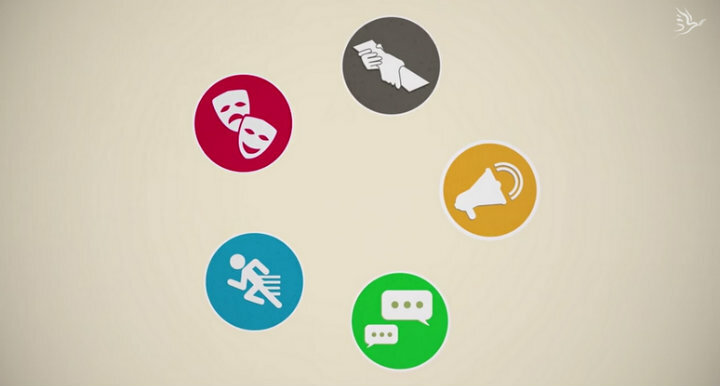 If a picture is worth a thousand words, an animation can tell a story that can propel people to action. After coming across TechChange’s animation for DME For Peace last summer, Generations For Peace approached the TechChange Creative Team to help tell their story of promoting peace through an animation. Julia Kent, Director of Donor and Partner Communications at Generations For Peace, stressed that an animation was the perfect medium for telling their story. She emphasized that, “peacebuilding, and particularly sustainable peacebuilding via the Generations For Peace model, is a complex story to communicate. We felt an animated video would be an excellent medium to use in simplifying our story, and to show powerful and tangible visual examples of the work our volunteers do around the world.” The goal of the animation was to communicate this story of the powerful impact of youth volunteers sharing conflict resolution practices with others, carrying out their mission to “Pass It On” – ultimately urging viewers to take action by contributing their time, donation, or voice to GFP’s efforts. 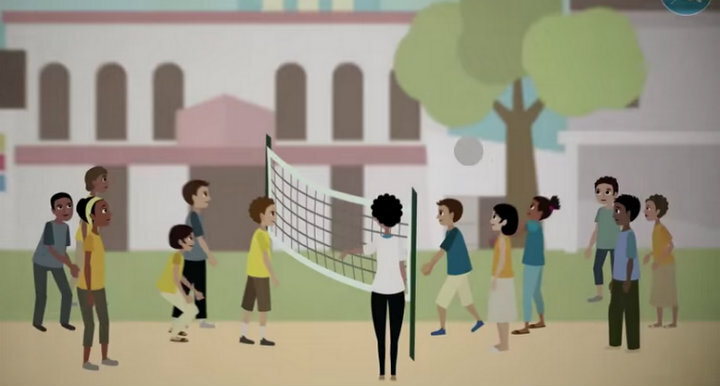 We’re proud to announce the launch of our latest animation with Generations For Peace. The Generations For Peace story is one of personal and community transformation, so the youth characters in the animation were vital in its storytelling. It was also important to have many diverse characters as well, to show the potential for peaceful conflict transformation to restore relationships between people of different backgrounds. The animation also needed to reflect Generations For Peace’s work in a variety of rural and urban contexts in 50 countries in the Middle East, Europe, Asia, and Africa. By understanding Generations For Peace’s vision for an animation, we used simple, papercut-style characters in the animation to be able to have a longer animation of 3:05 minutes with many different characters and activities to fully communicate their various vehicles for peacebuilding. We used mixed teams of blue and yellow uniforms on each team (instead of one team of blue and another of yellow) to emphasize how GFP volunteers facilitate sports-based games that require cooperation between different groups as a medium for peacebuilding. GFP’s guidance in reflecting their brand and communicating culturally relevant messages in the animation was crucial in coming up with a great final product. Julia also added that as this young organization is poised for another strong year of growth, they are excited to use this animation to reach more supporters and partners to support their mission. Organizations like Generations For Peace are doing very important work, and at TechChange, we help tell their stories in an engaging way, helping them communicate their story to a wider audience. We are excited to see Generations For Peace’s growth in the upcoming year! Make sure to check out the ‘Pass It On’ video here, and let us know if you’re interested in sharing your organization’s story or a campaign by contacting the TechChange Creative Team at info@techchange.org. We were so impressed by the work of the TechChange team: they showed superlative professionalism, creativity, and responsiveness in a great collaborative approach which delivered a fantastic result! Mark Clark, CEO, Generations For Peace. And we loved working with the team at Generations for Peace! It was exciting and satisfying to help communicate the important message of this wonderful organization.